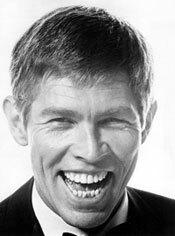 The villainy of lean, gangly James Coburn proved so personable that his suave demeanor and tooth-filled crooked smile thrust him to major stardom. Born August 31, 1928, in Laurel, Nebraska, his family moved to California in 1933 after his father’s business in Nebraska was wiped out by the Depression. Following high school, he attended Compton Junior College in 1950 where a classmate recalled Coburn sang in the College glee club. After service as a radio operator during the Korean conflict, Coburn enrolled at Los Angeles City College where he majored in drama. He also studied with Stella Adler in New York City before making his first significant role in a live “Studio One” presentation in 1957. 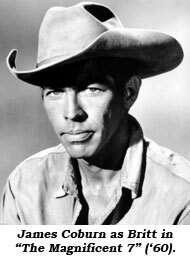 Beginning in 1958 he was being seen on all the major TV westerns—“Wagon Train”, “Rifleman”, “Tales of Wells Fargo”, “Bronco”, “Cheyenne”, “Restless Gun”, “Bat Masterson”, “Have Gun Will Travel”, “Lawman” etc.—where his tall, lean, relaxed but tough screen persona kept him in constant demand. Director Budd Boetticher cast him in his first big screen western, Randolph Scott’s “Ride Lonesome” in ‘59. A chance meeting with friend Robert Vaughn tipped him that director John Sturges was casting “The Magnificent Seven”. Coburn persuaded the director to cast him as Britt, the guy with the knives, in the western version of Kurosawa’s “Seven Samurai”. From that star-maker role, director Sam Peckinpah hired Coburn for “Major Dundee” (‘65) and “Pat Garrett and Billy the Kid” (‘73). At the same time, James Bondish spy spoofs “Our Man Flint” (‘66) and “In Like Flint” (‘67) further elevated his star. 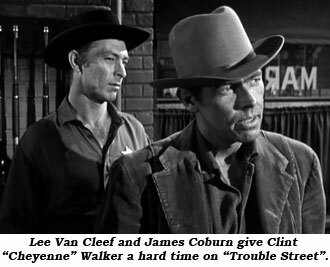 Coburn continued to appear on episodic TV through 1964, including a regular stint as gambler Jeff Durain on NBC’s “Klondike” (‘60-‘61) with co-star Ralph Taeger. After 10 years of suffering, Coburn began to shun doctors and drugs to find his own relief from his crippling arthritis through a series of alternative treatments, including electromagnetic therapy and heavy dosage of MSM. Coburn’s health rebounded to where he won the Best Supporting Actor award for “Affliction” in ‘99. Coburn was first married to Beverly Kelly from 1959-1979 when they were divorced. They had one son, James, born in 1961. Another daughter, Lisa, was born in 1957. He married Paula Murad in 1993. 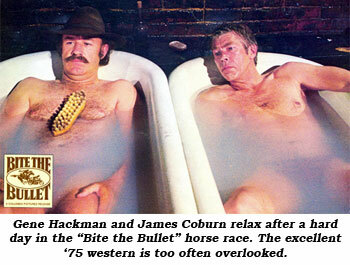 Coburn, 74, died of a heart attack in his wife Paula’s arms at his Beverly Hills home on November 18, 2002.